Technology may be different in 2060 New York, yet the city is still a place of many cultures and great divides. 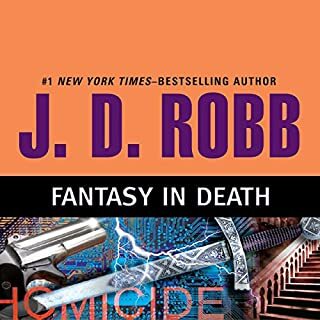 And as ever, some murders receive more attention than others - especially those in which the victim is a prominent businessman found in his Park Avenue apartment tied to the bed - and strangled - with cords of black velvet. 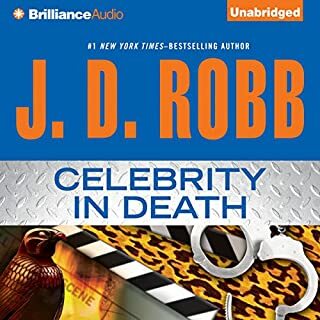 In this novel from number-one New York Times-best-selling author J. D. Robb, the newly promoted captain of the NYPSD and his wife return a day early from their vacation, looking forward to spending time with their bright and vivacious 16-year-old daughter, who stayed behind. Not even their worst nightmares could have prepared them for the crime scene that awaits them inside. 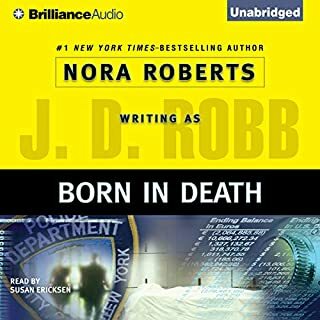 On Manhattan’s Upper East Side, a woman lies dead at the bottom of a brownstone’s basement steps, stripped of all her valuables. Most cops might call it a mugging gone wrong, but Lieutenant Eve Dallas knows better. 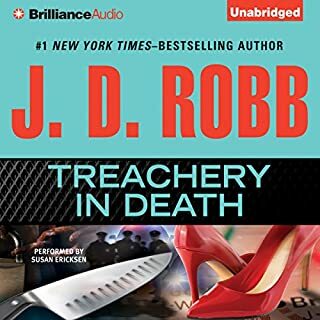 A well-off accountant and a beloved wife and mother, Marta Dickenson doesn’t seem the type to be on anyone’s hit list. 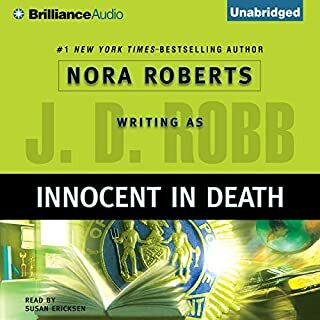 But when Eve and her partner, Peabody, find blood inside the brownstone, she knows Marta’s murder is the work of a killer who’s trained, yet not professional or smart enough to remove all the evidence. 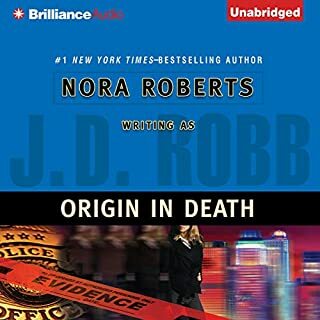 Eve is catapulted back to a case nine years earlier, when a man the media tagged "The Groom" put the city on edge with a killing spree that took the lives of four women in 15 days. Eve and her partner, Feeney, her friend and mentor, couldn't stop him before he disappeared, only to resurface in other parts of the world to kill and kill again. But now The Groom seems to have come back to where he started. 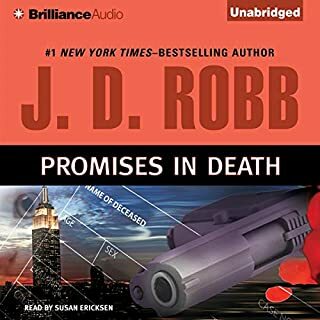 When it turns out that The Groom's most recent victim was employed by Eve's billionaire husband, Roarke, she brings him onto the case - a move that proves fitting when it becomes chillingly clear that the killer has made it personal. 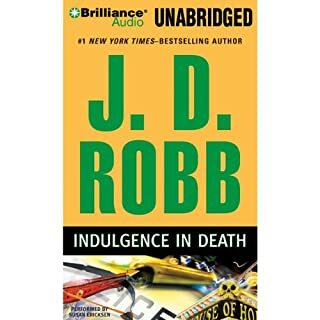 The corpse was washed in products from a store Roarke owns and laid out on a sheet his company manufactures. With the Groom's monstrous return, Eve is determined to finish him once and for all. Familiar with his methods, she knows that he has already grabbed his next victim. 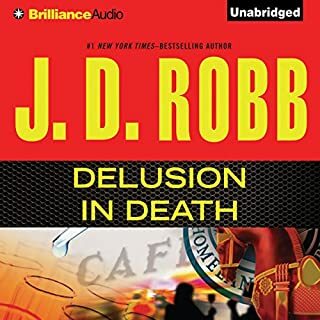 But his sights are set on the biggest challenge of his illustrious career - an abduction that will test his skills and that promises to give him satisfaction as he's never known. Time is running out on another woman's life...and for Eve. One of my favorites thus far!! 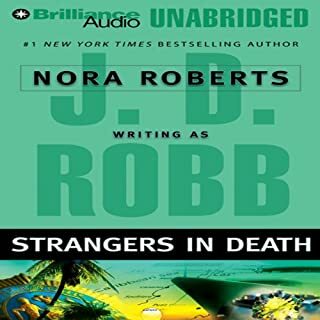 This time Nora Roberts as her pseudonym J. B. Robb hit it out of the park!! This book had all the intrigue you could ask for in a mystery novel! I liked how she stuck to the story line without adding in all of the sexual play by play she is so well known for. I didn't have to fast forward through much of that in this book. Congratulations to her on an excellent crime novel! Love the characters, love the voices, love all the books. The excitement, the exhaustion and caring really come thru in this one. Love that Eve doesn't stop and will do whatever is necessary to save someone else from being killed, even endangering herself. 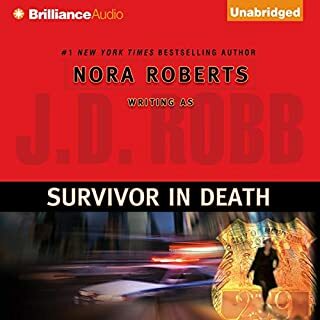 This was one of my very favorites I think because Roark really got to be totally involved and see how the cops worked from the inside. KEEP WRITING, KEEP RECORDING! They are wonderful. For those who said some of the books, the voices were off. Be quiet. Just keep listening and all gets back on track. I NEVER had trouble distinguishing who was talking. These books were written to be listened too. As all ways J.D. 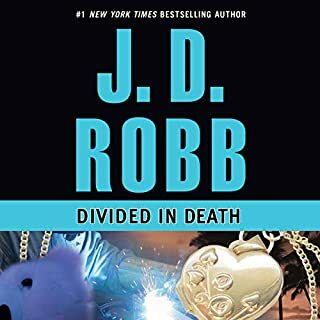 Robb has been a good read, and the narrator does a great job in getting you to be able to see all the characters in full view. Only the premise. Well, okay, maybe not that drastic, but that's my shoot-from-the-hip response. Generally, it's easy to accept a certain amount of graphic violence in a procedural cop story. It goes with the territory and when done properly is also an indicator of an authors ability to present that material in an exciting, logical and artfully descriptive way without being gratuitous. It's a thin line and generally Robb / Roberts dances skillfully down that line - the graphic material is so organic you don't really notice. Unfortunately, for me at least, this one strays on the wrong side of that razor edge - razor being the operative word, along with blow torch, hole punch and other assorted toys. It was just too much. As always, the relationships, the witty banter, the arguments / resolutions and of course the pure unadulterated steam were the best parts of this one. In this case though, the bad guy, his methods and madness were not as entertaining or dynamic as the usual villain. He was simply, disgustingly twisted. Worse than being a disturbing character, he was boring. The Thrilling Conclusion of course but any time Eve has to touch the baby is a hoot and this obligatory Mavis / baby scene is no exception. Did Creation in Death inspire you to do anything? It almost inspired me to move on to the next one without finishing it, but I stuck it out and I'm mostly glad I did. While I personally feel this one could be skipped, if you don't mind the unsettling graphic parts, this is another fun-filled romp through the life of Eve, Rourke and the Whole Wacky Crew at the NYPSD. One thing I noticed in this one was what seemed to be a new depth to some of the subordinate characters. We get a new glimpse into the thoughts of Rourke and Feeney especially and to a lesser extent, Peabody. Subtle, but still noticeable. 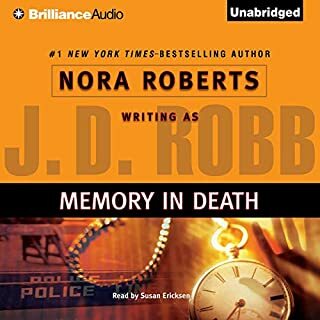 Would you try another book from J. D. Robb and/or Susan Ericksen? Yes. 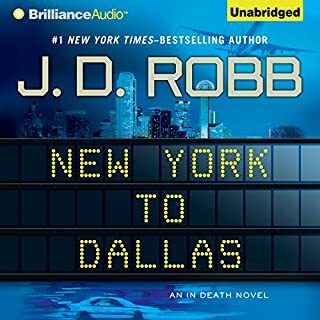 I've been listening to the series & enjoyed it up until now. This one stands out as, well, gruesome. Not for me. The others in the series posed interesting puzzles. This one is something I can't stand to contemplate. 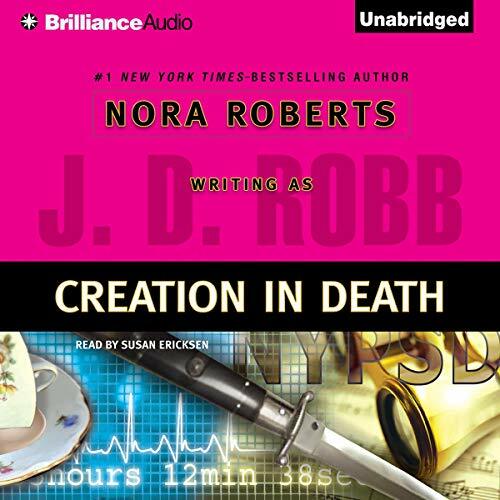 Would you consider the audio edition of Creation in Death to be better than the print version? 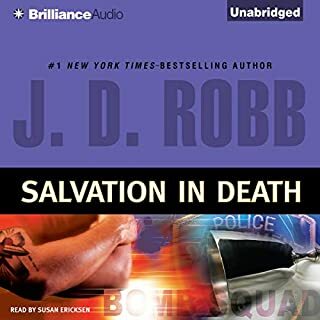 Has Creation in Death turned you off from other books in this genre? I don't know if turned off is the word. 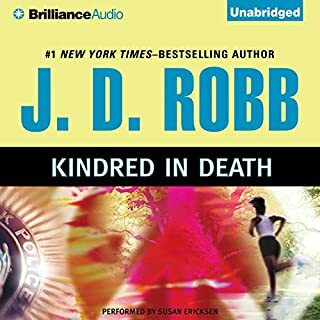 It's just that the in death series is the best I've ever listen to or read. The depth of the characters. You feel like you know them. And you want to know what they're going to do or how they're going to grow further. I hope this series never ends. I'm 65 and I hope I get two or more year for the rest of my life. 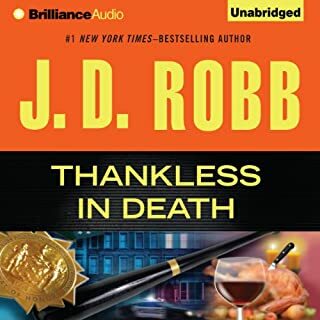 That's so difficult… I think all of us women are just over the top on Roarke.. That being said she makes all the characters your favorite. It's hard to believe it's just one person with all those voices and personalities brought to life. I'm not an expert. I just know that I would watch and by the films. But more then a film I think that something needs to be done like Amazon did with Bosch... They made one book several different shows. That way you have 20 hours to do a book. Netfx and Amazon you don't know what you're missing. Very disturbing, the torture scenes. And the backstory of the victim made me want him dead even more, for being so selfish. I loved the ending, however, and how things worked out. 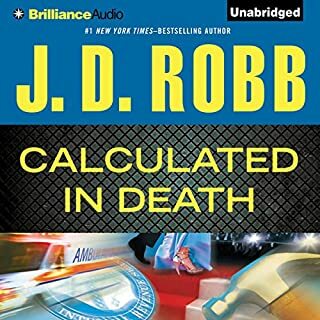 By far the best of the In Death series so far. I didn't pick the killer until nearly the end, which to me indicates a well-written book. I'm actually having trouble bringing myself to listen to anything else because I enjoy Susan's readings so much. She's sooo good with voices and pretty good with most accents too.